Trafalgar Wharf: You've met the team, now meet the machines! Our mighty Marina Bull forklifts, Emma and Fanny (named after Lord Nelson’s wife and mistress!!) 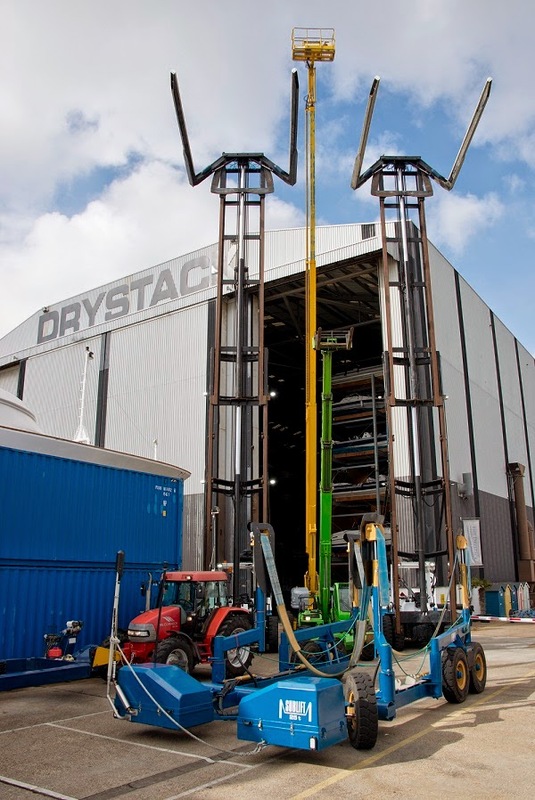 are used in our Drystack which offers launch and recovery on demand, just like valet parking for boats. These custom built machines allow us to retrieve your boat from the lowest of tides, some 22ft below ground level, and store her safely away up to 60ft in the air in our indoor Drystack. Fanny and Emma can launch and recover boats in a matter of minutes. Gertrude the Cherry Picker extends up to 85ft in the air helping us to maintain our buildings and work on masts without the need to un-step. Mary the Merlo, or tele-handle as she is more commonly known, is our green beast. She provides us with a 4ton multi lifting capability. She can lift anything from pallets and small boats to masts. Suzie The Sublift is one of the key machines in our boatyard arsenal allowing us to lift up to 25tons of boat in ultimate safety. Suzie is a state of the art, fully submersible, remote controlled lift. This means your boat is never more than 1-2ft from the ground. Tallulah the Tractor and Chloe the Cono-Lift enable us to move your boat out of tight places in and around the Boatyard and Drystack.